I have always been a ﻿tea ﻿﻿﻿drinker. A mix of different herbs, the aroma in the steam they give, it makes my day start fresh and relaxed, and it ends the same way in the evenings. I tried to install the same habit with my sons, but you know how youths are these days. Always thinking they don’t have enough time and thinking they have to rush everything. They both started drinking instant coffee with their friends, and that became their everyday habit instead. My husband is also a coffee drinker. He, however, took his French Press coffee drinking to a higher level and decided he needed a new hand coffee grinder, a more modern one. One he could take with him on his business trips if he wanted to. Guess whom he asked on how to pick the best manual coffee grinder for French Press? Yeah, his kitchen-research-testing-improvement wife – me! 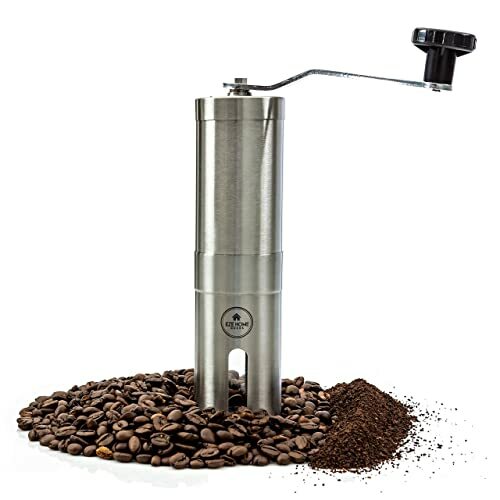 What to Look for in A Good Coffee Grinder for French Press? And I do have to say that my hubby has a ritual of how he makes his French press coffee. He is not a heavy coffee drinker. One cup at work, the instant kind, and one at home, no more than that. In his mind, it is more than the part where you put the coffee in the French press and wait till you get to press it. There are three glass jars filled with different blends of coffee beans inside them that he uses. He picks the right amount out of each one and then puts them in his hand coffee grinder. Sitting in his favorite chair, he starts to grind while watching TV or just to look outside of the window. By the sound his grinder is making, he knows when the beans are finished, knows the right size of the pieces inside. It is impressive, but not surprising, given how long he has been doing that with his old grinder. Of course, then he finishes making the coffee in the French press, but the grinding of the beans, that is my husband’s most important part in making his most enjoyable beverage. The look in his eyes and the way his body relaxes when he takes that first sip of his coffee makes all the work he did for that one cup of coffee worth it. That is also why he is the only one who can prepare the coffee to suit his taste. The first thing you notice in a manual coffee grinder is the size. They are small and practical and fit well in your hand. They don't take up much room in the kitchen, and you can keep them in a drawer, like my husband does, or close at hand if you use them more often. Grinder’s small size is the reason he can carry it wherever he goes. The smaller size, however, limits them in how much coffee they can grind. Usually, you can only get enough for 3 cups of coffee in one round of grinding. For my husband that is plenty, even more than plenty because it's enough for him and our boys if they happen to be around when he is making one for himself. But for someone who drinks coffee often, just 3 cups might not be enough. His old grinder is the blade type. That means he needed to put more effort in the grinding part because the blades chop the beans in smaller pieces instead of grinding them. But since he doesn’t need the coffee to be so finely done for French press, he was ok with it. Most of the newer models, however, use a burr for grinding. They have a setting option where you can adjust how finely you want your grind to be, and you are ready to make your coffee. 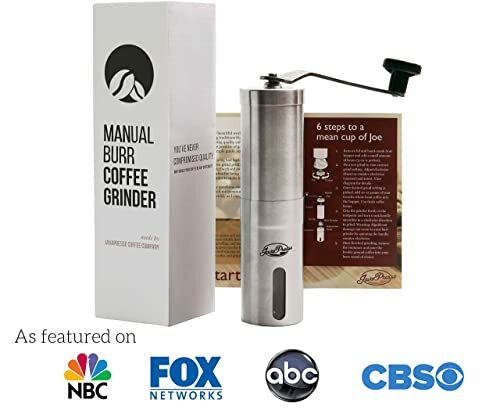 While looking into what kind of hand grinder to look for my hubby, I came across an interesting fact where the material of the burr matters a lot for the taste the coffee will have. If you use a steel one, the heat can influence the taste of the beverage which is not an issue with a ceramic burr because ceramic burrs don’t get hot while grinding. However, with further reading, I found out that the burr material matters when the speed is higher for grinding, like with electric grinders. Since manual coffee grinders use our strength to grind, the speed is not high enough to heat up the blades and influence the taste of the coffee. You need to have some muscle in your arms to grind coffee beans manually. Especially the first few spins. The resistance gets smaller as you keep turning and the longer you grind, the smaller the particle size is. My hubby’s hands have gotten so strong because of the grinding that he can open any jar for me now. Washing them is also easy, so there is barely any effort in keeping them clean and working properly. I listened how the electric grinder works often enough while visiting friends. For those couple of minutes, you can’t even have a proper conversation without yelling. While my hubby is doing his grinding, the sound is almost soothing. It cracks at first, but as the pieces get smaller, the sound also softens. It never bothered me because, while he is making his coffee I can ask him about his day at work and what he wants for dinner and we can hear each other. As I mentioned, because of his work, my husband needs to travel from time to time, and he decided he needed a new coffee grinder. One he can also carry with him while away from home. So, this is where I come with my research skills. I made it my special mission to find the best manual coffee grinder I can so he can enjoy making and drinking it even more than he did before. So, I am hoping that one of these top 5 manual coffee grinders for French Press will meet my husband’s every need in picking the best one. If you have a need for this device, you won’t make a mistake following my lead! The first thing you notice about this product is that it fits well in your hand for its size of 7.5 inches (19cm). The handle and the base are both made of stainless steel. The black knob on the handle is plastic, however, so you might need to be careful with that. Be careful if you hold it in your hand for a longer time because it can slip from sweaty hands. Under closer inspection I’ve realized that the most of the important parts are also made of plastic, so the same rule about being careful applies here as well. 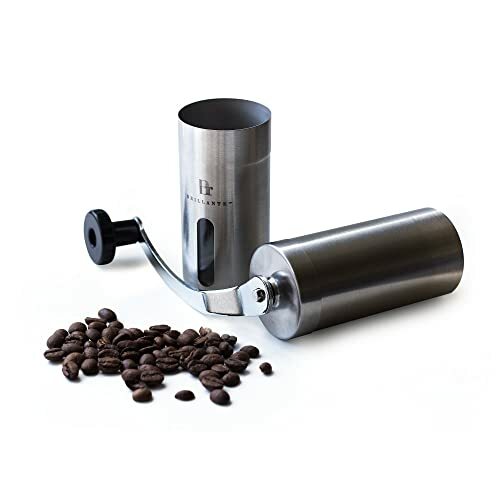 So even though the grinder seems durable on the first glance, that might not be the case because of the key parts being plastic. The grinder itself is working rather well for its size and can grind for 2 cups of coffee the most. It’s silent and has 18 precision settings. The difference in settings is so small though that you’ll barely notice it unless it’s a few numbers apart in settings. And even when it’s set on its smallest grind size, the coffee won't be as powdery as you’d want. For a French Press, they are good enough. Even though it says it gives consistent grind size, that is not entirely accurate. You can still find some bigger pieces even if you grind longer than usual. There is a small window on the side of the grinder, so you can check if you made it right. There is also a 30-day money back guarantee so you can return it if it doesn't meet your demands. This hand grinder is also one of the smaller models, 7 inches in length (around 18cm). It’s made of stainless steel. Same is with the handle which is a bit longer for easier use and has a plastic knob on end, so you have to pay attention not to break it by accident. It is a bit harder to hold on to it if you need more time to grind your coffee because your hand will get sweaty and it might become slippery. So, it might be a good idea to have a hanky close at hand. This model also has a small window on the bottom part so you can see if the burr is grinding the coffee beans as you need it and it fits Aeropress coffee maker as well, so it’s good for trips. Unfortunately, even though they have inner parts made of stronger plastic, the piece that holds the grinding mechanism is still its weakest part because it's prone to breaking in half after some time of using it. It has different grind settings, and I have to confirm that the grinding is consistent. If you set it for the coarser grind for French Press, you will get the size you wanted. If you need finer grinding, then I am afraid you will need to grind a bit longer. You will be able to grind spices and herbs in this grinder as well, so it's a very useful utensil to have around. And remember, it is small, so it can only make enough for 2 cups of coffee the most. If you find out this model is not right for you, you have a 30-day warranty. This hand grinder has the same size as the first one, 7.5 inches (19cm) with a slim-fit build so you can hold it while grinding easily. The first distinctive difference between the two is the price – this one is more affordable. Stainless steel makes it a little harder to hold if your hands get sweaty but that is easy to sort if you have a hanky or something similar close at hand or try to finish grinding faster. The important parts inside, the piece that holds the grinding mechanism, is made of plastic and a very brittle one because it breaks easily. Thankfully, you have a 60-day guarantee from delivery where if you are not satisfied, you can get your money back. So, you are safe if anything happens within this period. You can grind enough beans for 2 cups if you like your coffee stronger or even three if you like it milder. The burr grinds the beans with excellent consistency. You can grind it fine enough (with little more effort though), to even make Turkish coffee if you like drinking it. You could check the grind size in the small window on the bottom part and see if you need to set the grinder in a different way if you made a mistake in settings. It can happen because there are no markings to tell you what setting you are on at the moment, so I advise a little testing to find your perfect grind size. The first thought that came to my mind when I saw this grinder was how small it was and affordable. It’s only 6.7 inches long (17cm), and it's perfect if your needs are 1-2 cups of coffee on the go. It comes with a free cleaning brush, a spoon for putting beans in the grinder, free inner plastic part and an online chart for grind settings. 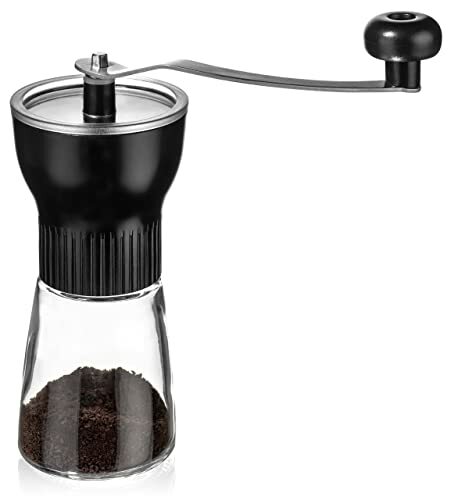 It’s made of good-quality stainless steel and because of its size, it’s very easy to hold it and grind. It will make your hands sweaty, but the grip won't be as slippery as with slightly bigger models. However, the inner parts are plastic and prone to breaking after some time of using the grinder. Especially the part that handles the biggest stress of grinding. That is why the free replacement part is included in the package. The burr has 18 different settings for grinding, and its consistency in grinding is also very good. It can grind for French Press and Turkish coffee, but there are no markings that tell you the size setting you have at the moment, so you need to test the settings first before using it. A good thing about this grinder is that it performs very well grinding the herbs and kitchen spices. You might need to cut some into smaller pieces before putting them in, but it works well enough. It’s silent while grinding and you can check the grinding results in a small window on the bottom part. This grinder model is different from others in appearance. It has a glass jar where you can grind the coffee and still keep its aroma and flavor safe inside. The top part is hard plastic, as well as the knob at the end of the handle, so you need to be careful how you take care of it. The plastic shape of the top part provides you with a solid grip while grinding, so even with sweaty hands, you don't need to think about your grinder slipping. That is a great feature to have considering how previous models have that kind of problem. It’s 7.5 inches long (18cm) and 3.5 inches wide (around 8cm) which makes it a bit bigger than standard size because the glass jar can hold up to 50 grams of coffee. That means you can have 2-3 cups of coffee from one grind, or if you fill it up, even more. The grind consistency is also very good, so you can choose what kind of coffee you want to make because it has adjustable burrs that are more silent while grinding compared to some older models. Picking the best manual coffee grinder for my husband’s French Press was not easy at all considering that they all had similar advantages and one particular flaw concerning the inner plastic part that just kept breaking no matter the model. 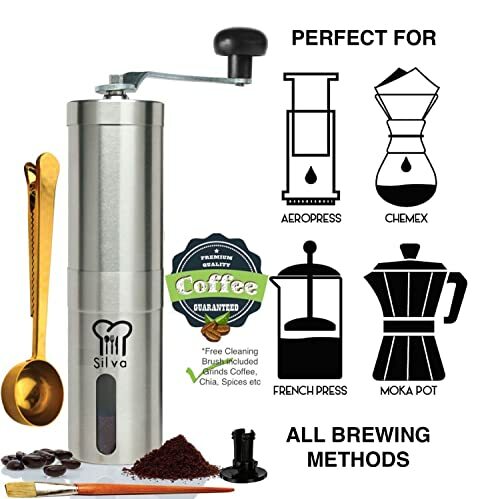 So, I focused on other useful features these products have, and combined with my husband’s needs; I picked the Silva Manual Coffee ﻿﻿Grinder. The winning point, in this case, was the grinder being small enough so he can take it with him anywhere, no matter how much luggage he packed. So, he can make coffee for himself and won’t need to toss the extra coffee in the kitchen trash, but also be able to make at least one more cup if there is a visitor. You, on the other hand, can have different demands from the grinder. Consider your needs and the way your grinder will be used and chose the products accordingly. I’m glad you like them, Miguel!